Features 2 classic glass champagne flutes with confetti design. Pop the champagne and raise a glass! It's time to celebrate with this toast-worthy collection of Dom Pérignon infused delicable sweets! 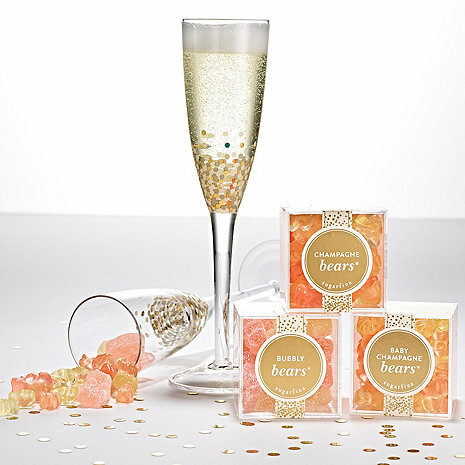 This unique gift set includes two classic champagne flutes designed to enhance the bouquet, taste and effervescence of your favorite bubbly, as well as three best-selling champagne candies made with Dom Pérignon Vintage Champagne: Champagne Bears®, Bubbly Bears®, and Baby Champagne Bears®. Are the flutes glass or plastic?